The CW-3 3G-SDI Wireless Video Transmission System from IDX transmits 1080p60 video up to 164' line-of-sight with no quality loss and less than 1 ms latency and up to a maximum of 380' in optimal line-of-sight conditions. The transmitter/receiver system features 3G-SDI input/output and has a compact design that's suitable for gimbal and drone operations. A shoe mount is included for mounting the transmitter on a camera. 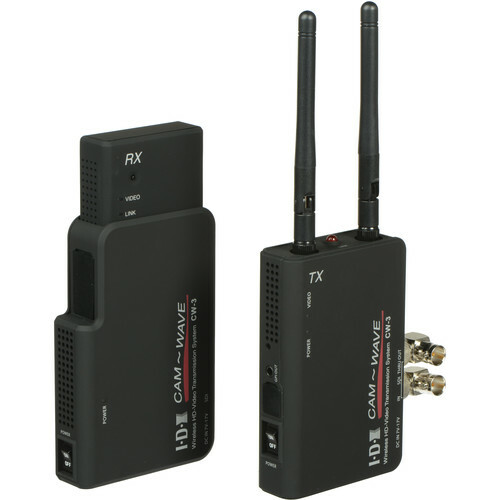 Box Dimensions (LxWxH) 12.8 x 8.7 x 5.45"
CW-3 3G-SDI Wireless Video Transmission System is rated 3.4 out of 5 by 10. Rated 3 out of 5 by Rob from Does not work in 23.98psf ! Works well, but does not work on 23.98psf. Many cameras, including the F5 and many xdcams, only output 23.98psf when recording 24p. Rated 5 out of 5 by Sal from It works right out of the box! This is a plug and play unit, with no signal lost or latency. Sending signal from a JVC camera sdi output to a Datavideo 2200. For the price is a no brainer. My only complain is it does not come with a battery and it only includes 1 power supply. We used a standard 12vdc p/s we had laying around and voila instant wireless video. Rated 3 out of 5 by Anonymous from Okay under the right conditions I've had a few issues with my CW-3... (1) Reliability of the signal: If transmitter and receiver are close to one another, the signal seems to pretty much be rock-solid. But if there are obstacles in the way or there is much distance between themthe signal will drop and then take 30-60 seconds at a minimum to resync once they are back in line-of-sight of one another. Even then it doesn't always resync on its own and requires a reboot of the receiver and/or transmitter. (2) These don't handle 3G-SDI very well. They officially support 3G Level A, but the output of the receiver doesn't comply with SMPTE standards very well and I have to run the signal through a Decimator MD-HX to clean it up so other equipment can use it. None of my other gear will recognize the output signal at all otherwise. I've been working with IDX Support on the issue and they think they might be able to fix this with a future firmware update, though they aren't promising that, and I'm not holding my breath. (3) Oddly, if I try to transmit a signal passing through my Decimator devices, the transmitter won't recognize the signal at all, no matter what resolution and frame rate. Which means they are picky about what 3G signals they will support. I haven't had any issues with my cameras, but there's no guarantee that a different camera won't have issues. Overall it seems like these have a few bugs in them that need to be worked out. Rated 3 out of 5 by Anonymous from Dual camera blues We ordered 2 of these units and mounted them on a dual directors cage for 2 camera monitoring. Pretty sweet rig!. We had already done this with our Paralinx units and it worked beautifully for years. These units work well too... one at a time. They work straight out of the box and deliver great image quality. Our problem began when we used two in tandem. For some reason when our cameras get closer than 20 feet from one another one of the units loses its picture. When the cameras separate it comes back. Its not consistent which unit loses picture, but one always does. The folks at IDX suggest that the issue is related to the receivers on the cage being too close together. Nothing we can do there. So for the time being we can use one or the other but not both at the same time unless the cameras are far apart. SO... if you only need one transmitter receiver combo, I give it 5 stars. Easy setup, great image quality. Two thumbs up! If you need to run two or more at a time, beware. Rated 5 out of 5 by Mlisa from great product...even using multiple units at the same time. We have two of these and they work really great! We use them on the downstage edge of our stage for live video on our hand held cameras. We use them in a wi fi heavy environment with both 2.4 and 5g networks and they have been rock solid. Range is fantastic....it doesn't go through walls perfect but it is surprising. I've used these and the Teredeks and these are better and cheaper. Rated 5 out of 5 by Tyler Hanson from Great Investment We were so hesitant. This is almost bottom of the line pricing, and we didn't have our hopes up, but it works really, really well. We plugged it into our P2 Panasonic AG-HPX300P (circa 2007) and were floored with the quality and latency (or lack thereof). Our walls really took away the signal, but we LOVE it for our house of worship. Rated 3 out of 5 by Anonymous from IDX CW3 got one today and tried it in an indoor environment. managed to get thru a maximum of 2 reinforced concrete wall, each 100mm thick at around 8metres range. Will try outdoor tomorrow. Rated 1 out of 5 by AV Professional from Cut your expected Transmission by half! I purchased this unit with the mindset that it could do 164' of wireless transmission. I could not be more incorrect. I tested line of sight indoor and outdoor with about 75' before it would start digital tiling. It was not impressive. I tried different sitations and even tried through walls. That lasted about 30-40'. This was no better than a $ wireless HDMI unit from mononprice. I also found the unit to be built with a plastic feel, which didn't sit well with me for long-term durability. I ended up going with a Teradek 300 unit. It was built with metal housing, and seems like it will withstand much more industrial use. It's the first unit I have bought from teradek and is significantly more expensive, but it did the job. I could get 150' before it would break up with tiling. The irony here is that the Teradek 300 was rated for 300' of wireless. word to the wise, the claims of distance are most likely tested under minimal interference conditions. Whenever you want to go wireless, cut the 'claimed distance' in half and that will be your real distance. Can you use 4 of these at one time? Yes, you can. Each transmitter/receiver is paired. Has anyone used this in a Point to Muli-Point solution, and is that possible? I have 3 cameras running the transmitters in our large room. We have 3 receivers connected to a switch that supports HDSDI. The transmitters and receivers find each other when they are powered up. The units are persistent, meaning that they always connect as a receiver / transmitter pair. Do not have any idea how many can be used in the same frequency space. I do know that I am running 3 and that I have two 5 Ghz wireless networks running in the same space. Transmitters run at 5Ghz and they just find open frequency bandwidth every time they start up. Awesome gear! This only came with 1 power supply. I need another one, but don't know what to get. Any advice? This should have come with 2 AC power supplies. You should contact B&amp;H Customer Service so that we can fix that. If you wish a battery supply for the transmitter, the box should have come with 2x P-Tap power cables for use with the large P-Tap equipped V-mount or Gold mount brick batteries. If you do not have these, please find attached a small battery accessory. We are not aware of range extenders for this product. There are 2 x P-tap cables and 2 x SDI cables in the box. how can I power the transmitter by usb port on a gimbal? Hi, does it work with the blackmagic cinema camera 2,5k? Yes, we use it to link our BMCC to a large studio monitor. Just make sure you are 5-10 feet away when you first turn it on. Once it has linked, it can be right next to the monitor or anywhere in a large studio, even the control room.